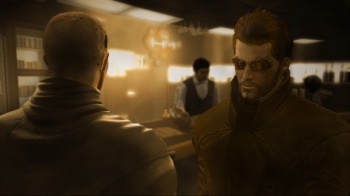 Square Enix says it's close to coming up with a solution to the soundtrack problem that plagues the Augmented Edition of Deus Ex: Human Revolution on the PlayStation 3. You may have noticed, if you purchased the Deus Ex: Human Revolution Augmented Edition for the PS3, that the included soundtrack is actually contained on a Blu-ray disc, not a standard DVD. This isn't a problem if you're only listening to it through your console but it does become troublesome if you want to dump it onto your PC. Most PCs don't have Blu-ray drives, you see, and without one of those the disc isn't going to do you much good. Square Enix has been on the case ever since the game launched and now, two weeks later, it's apparently in the "final stages" of coming up with a way to make things right. The company gave no indication as to how it might go about providing digital music files to thousands of internet users from around the world but you can be sure that with their best minds working on the problem for more than half a month, whatever they come up with is going to be brilliant. Brilliant, I say! Naturally, we'll let you know when it unveils its master plan to the world.